Home Uncategorized Youth Summer Camp! 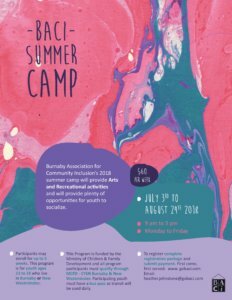 BACI’s Summer Camp will offer arts and recreational opportunities for youth aged 13 to 18 who live in Burnaby or New Westminster. The Camp runs from July 3rd to August 24th, Monday to Friday, from 9 am – 3 pm. Participants may enrol for up to 5 weeks. The cost is $60 per week. All participants must qualify through MCFD – CYSN Burnaby & New Westminster. Participating youth must have a bus pass, as transit will be used daily. To register, please complete the Registration Package and Emergency Consent Form, and send to Heather.Johnstone@gobaci.com and we will add your registration to the list. It’s first come, first served.